HILMAR, Calif. (KFSN) -- An unusual armed robbery of a Walgreen's in Hilmar has authorities looking for a man with a backpack sprayer. According to the Merced County Sheriff's Office, deputies were called to the Walgreens last Thursday after an employee had called and said they had just been robbed. Employees said a man wearing a white colored disposable jumpsuit, dust mask, a blue and white colored baseball hat, and sunglasses walked into the store with a backpack sprayer. Authorities said the man walked back towards the pharmacy and showed the staff a handgun in his waistband and demanded all the cash. The man then left in his pickup truck headed towards Turlock. 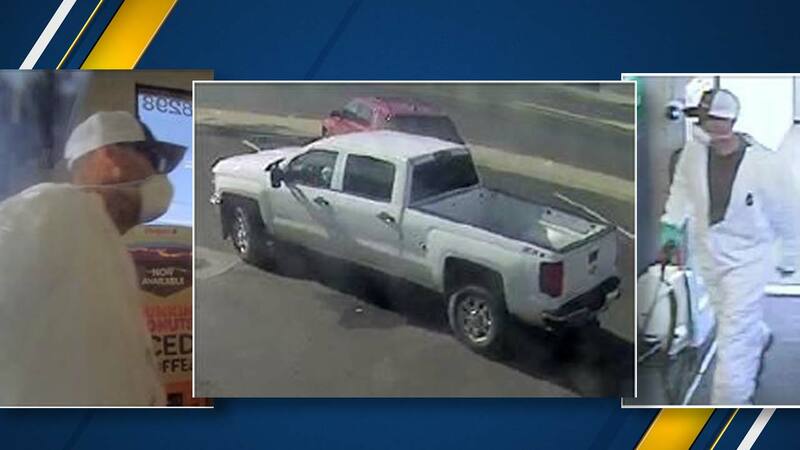 The truck was described as a newer model Chevrolet Silverado 2500 Z71 crew cab pick-up. If you have any information about this crime please contact the Merced County Sheriff's Office Investigations Division at 209-385-7472.